I had a few questions from my previous math post, so I thought I'd answer them here. My math notebook is just a cheap spiral notebook (you can get them for a penny in the summer). Each day of the week we do something different. Monday- Number Talk- There are so many ways to do a number talk. 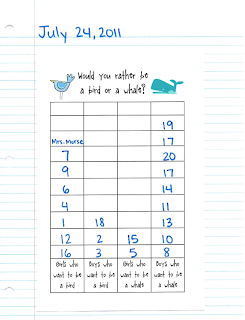 In first grade I try to keep it simple and just look for different ways to make a number. 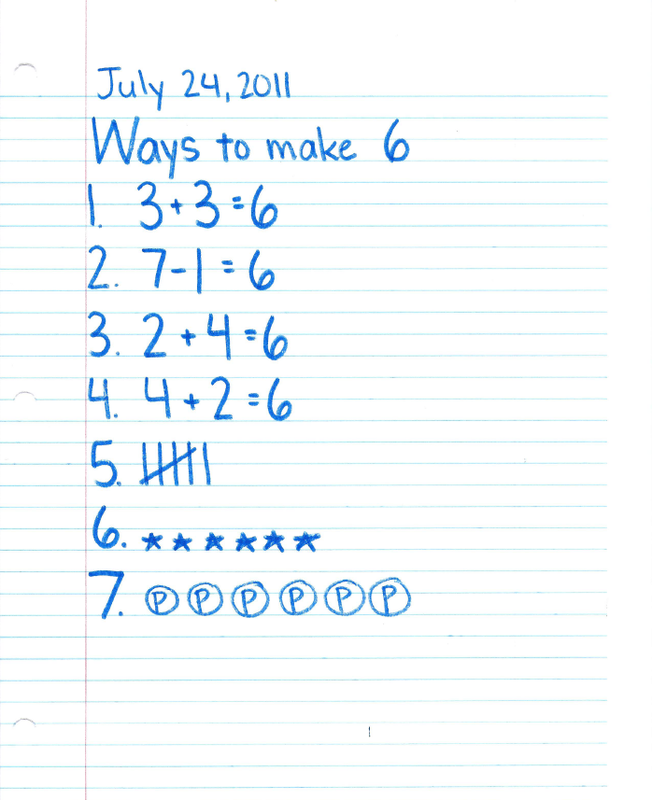 So, I have my kids write "Ways to Make ___" at the top of their page. 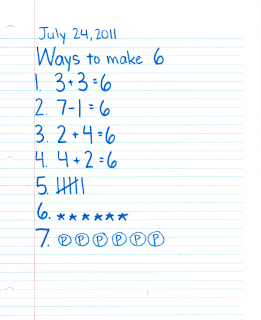 Then, they think of 7 ways to make the number using addition, subtraction, tallies, money, pictures, etc. After they are finished I will ask a few to share and write them on the board. Tuesday- Graphing- I create very simple graphs that fit 2 to a page. Each child gets a page and glues it into the notebook. We do our graph together using their notebooks and the Promethean Board. I go around the room, asking each child the question. 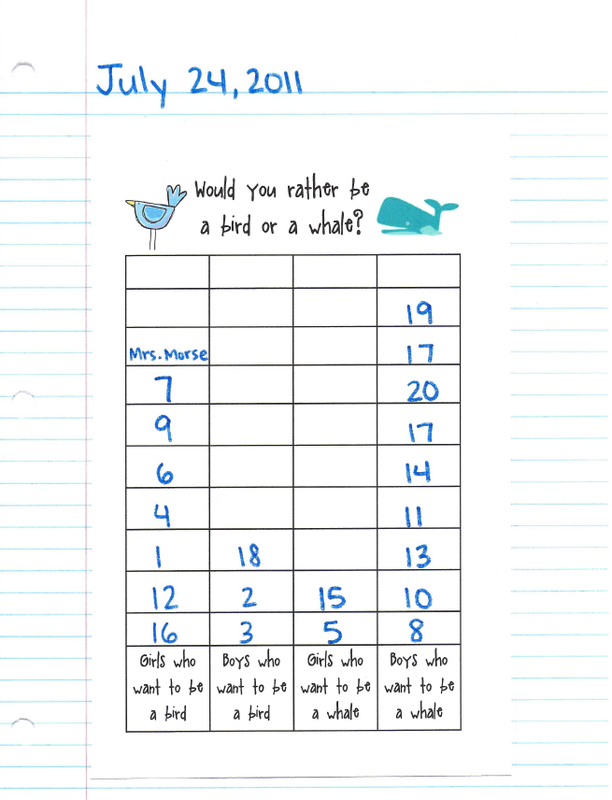 We all write the child's class number (easier than their name) in the graph. I ask follow up questions once the graph is complete. 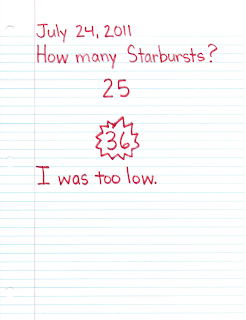 I try to keep the graphing questions simple during this time. Any really cute graph, like graphing Skittles or Goldfish, we try to do during our unit time. I like to include as many different types of graphs as possible (tally graph, graphs going up, graphs going sideways, graphs with different amounts of choices). Thursday- Problem Solving- I type up the problems on 2 X 4" labels. I give the kids time to answer the problems then we share strategies together as a class. I will record their answers on the board and discuss why some ways were better than others. 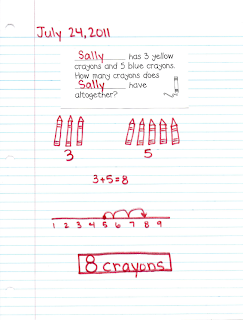 The kids are allowed to correct their answers in their notebook and change their thinking if needed. We do many different types of problems throughout the year. Here's my general progression (addition (answer unknown), addition (middle part unknown), subtraction (answer unknown), subtraction (middle part unknow), subtraction (beginning unknown), multiplication (super simple), comparisson, division (just grouping). I use CGI, Cognitively Guided Instruction, during my problem solving time. Friday- I don't formally teach math on Friday. In first grade, Friday is our day of Social Studies/Science Unit study. 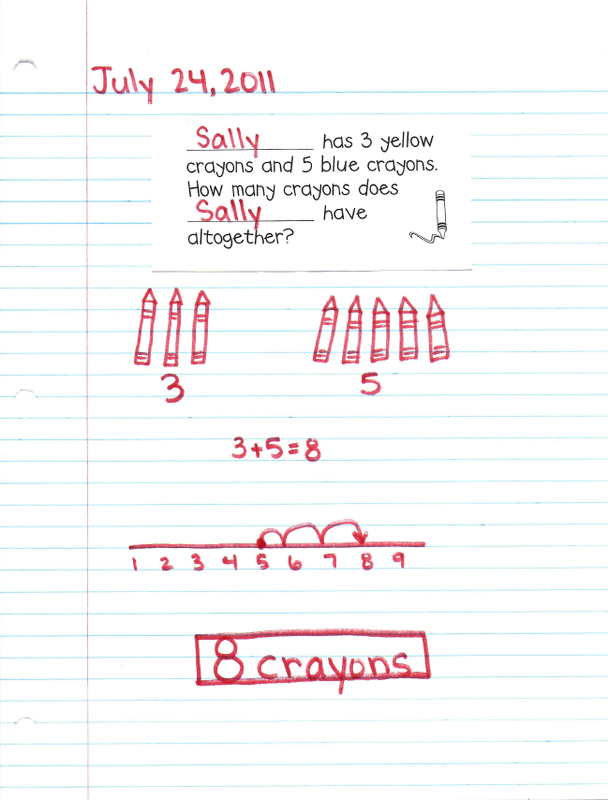 Of course, there are fabulous math (and reading and writing) ideas to tie in with any unit. So, we are always doing math on Friday. It just doesn't follow the same routines as the rest of the week (no math tubs, no math notebook). 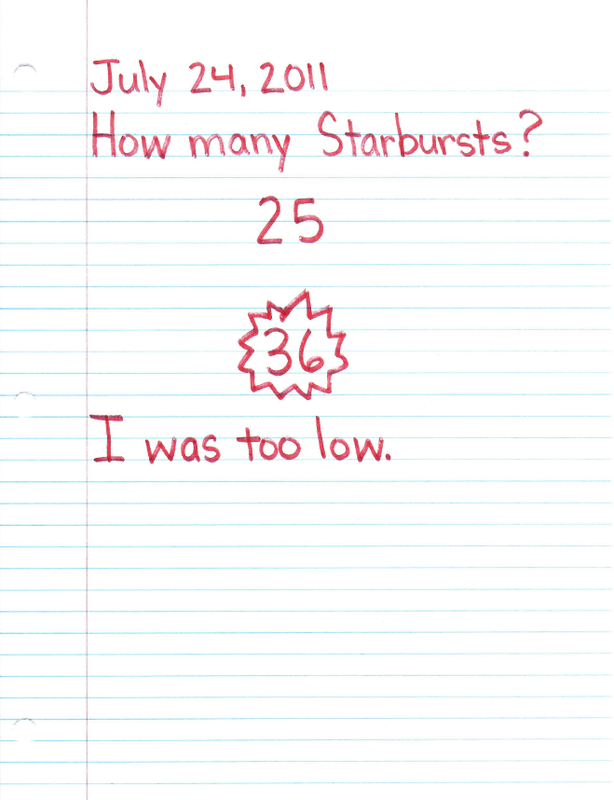 This is the time I pull out the cute graph, or we measure a pumpkin and count the seeds, or create a themed glyph, etc. Thanks so much for sharing your plan. Mt goal is to better organize my math journals. This past year was really hit or miss. We are going to use the Monday through Thursday plan for reading and math this year. Thus, science and social studies are only taught on Friday. How do you do this? I am very curious. Thanks also for the awesome math journal stuff. Big Reader- my journals also used to be hit or miss. And to be real honest, I get tired of doing problem solving every day (and I think the kids get tired of it too). Plus, there are SO many math concepts to teach. It's impossible to practice each one every day. Stacey- I LOVE teaching my unit on Fridays. You first need an administrator that's a little flexible with teaching outside the norm. When you first mention not teaching reading and math on Friday you might get some bad looks. But, in reality there are so many great reading and math ideas that tie right into each unit. Each Friday I still have Read to Self, a weekly spelling test, and time to read with our 3rd grade book buddies. The rest of the day is open. It gives me close to 3 hours a week to do hands-on activities focused around a unit. It's probably the same time you plan out each week (Monday-Friday) for SS and Science-- but let's be honest, that time is always planned for the end of the day and cut short. You will love it once you try it! I use to teach my science/social studies like you but with Common Core and our district moving toward STEM schools, we must teach science in our lit. block. We use FOSS. Eventually I will teach Pebbles, Sand and Silt, Solids and Liquids and Insects but it will take us 3 years to implement all of them. That's the thing about education, we always change. I am excited about the change as I think science hooks a lot of reluctant learners. Love your idea of a Math Notebook! We have just been able to substantiate all those concerning piece of ideas that one must need to regard about.